I beg to disagree with them "savings" mentioned in that ad. That ad assumes that the price of electricity isn't going to rise before the end of the bulbs life. I would argue with the first two columns. I don't have the means to do quantative measurements of the light outputs, but, subjectively, I do not believe an 11 Watt CFL is as good as a 60 GLS, nor a 20 equivalent to 100 Watt. Anyone here actually measured their outputs in a scientific manner? 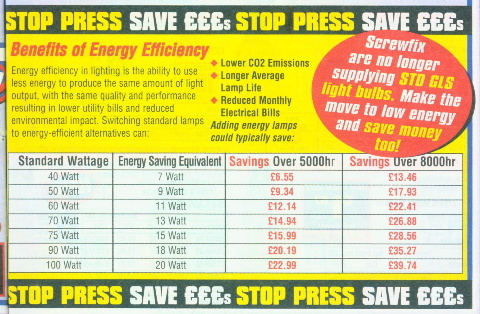 I do not believe an 11 Watt CFL is as good as a 60 GLS, nor a 20 equivalent to 100 Watt. I've got an 11 watt CFL here in my garage (until I upgrade the lighting) and a 60 watt Incandescent lamp nearer the back and they look reasonably similar in light output. Of course that is only subjective too, I don't own a lux meter to be able to compare them. If he price of electricity goes up you 'save' more surely? If it goes down you pay less!